I have a fairly large research project due this weekend and what am I doing about it? Knitting. This is the homework avoidance sock known as The Rivendell Sock. Yep, just like the Elven village in Lord of the Rings. Notice the textbook in the background as a blatant statement of Knitting-trumps-Research Project? I'm using Noro Silk Garden Sock and although it is a lovely sock yarn, I think a smoother yarn would make the pattern more prominent. This is the beginning of the Swallowtail Shawl. This is actually my third attempt at the beginning of the Swallowtail Shawl. For some reason, in the second repeat on row three of the Budding Lace chart, I mess up. Every time. I'm wondering if there is errata for this pattern. 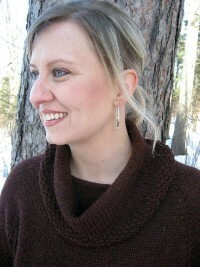 I'm using the pattern as published in Interweave Knits Fall 2006. I've looked everywhere. No errata. I must be the errata. I'm determined to knit this thing, so we'll see how many more times I need to frog this thing. Trollbeads. God help me. I do not need another addiction or obsession especially in the area of jewelry. These Trollbeads are just wonderful. They come in a variety of shapes and colors and they are fabulous quality. Sorry for the horrible picture of the bracelet. The bottom bead is "Horses", the middle bead is "Silver Mountain" and the top bead is "Jungend". Each bead has a story and you can learn more about them on the website. I hope your weekend is more productive than mine. Hopefully my homework avoidance will not demote me from Dean's List to Dean's-do-not-call-list.